Next stop on the Enola Branch is SHOCKS interlocking, named after the nearby Shock Mill Bridge. 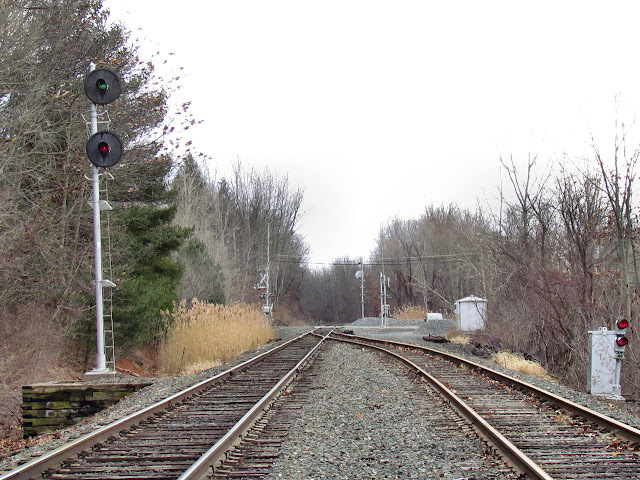 SHOCKS is a major junction in the former PRR low grade freight system between the Enola Branch and the Royalton Branch. 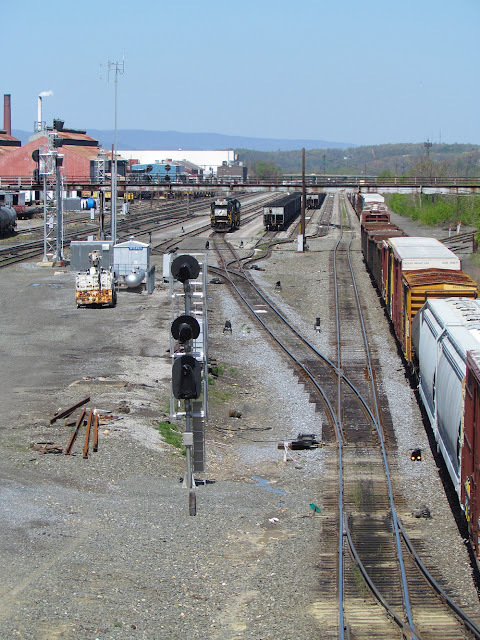 Originally built around 1905 as part of the A&S low grade improvements between Parkesburg and Enola Yard, SHOCKS is where freight trains could choose the west shore route to Enola or the East Shore route to Harrisburg on what the PRR called the Columbia Branch. Before the Main Line as we know it was constructed, the Columbia Branch was originally part of the Philadelphia and Columbia Railroad, that in tern functioned as part of the Main Line of Public Works connecting connected Philadelphia to Pittsburgh. In the 1995 Conrail Diagram CP-SHOCKS can be seen as one of the more interesting features and by that time served as the only remaining junction between signaled lines on the entire Port Road/Enola Branch north of PERRY. SHOCKS as it stands today was constructed in 1938 as part of the electrification project and along with towers like THORN and PERRY, it represented the PRR's first big foray into CTC systems, although notably with the Traffic part missing. SHOCKS was an all relay plant with a US&S 504 code line running a few miles south to COLA tower in Columbia. Here is a 1960's era interlocking diagram showing lever numbers as part of COLA's area of control in a similar fashion to the THORN machine. SHOCKS was built as a 2x2 flat junction and crossover so that trains entering on any track could then exit on any track. There are two crossovers and two single turnouts for the Columbia/Royalton branch. It also featured a connection to the Marietta Industrial Track which used to serve a government defense storage facility. 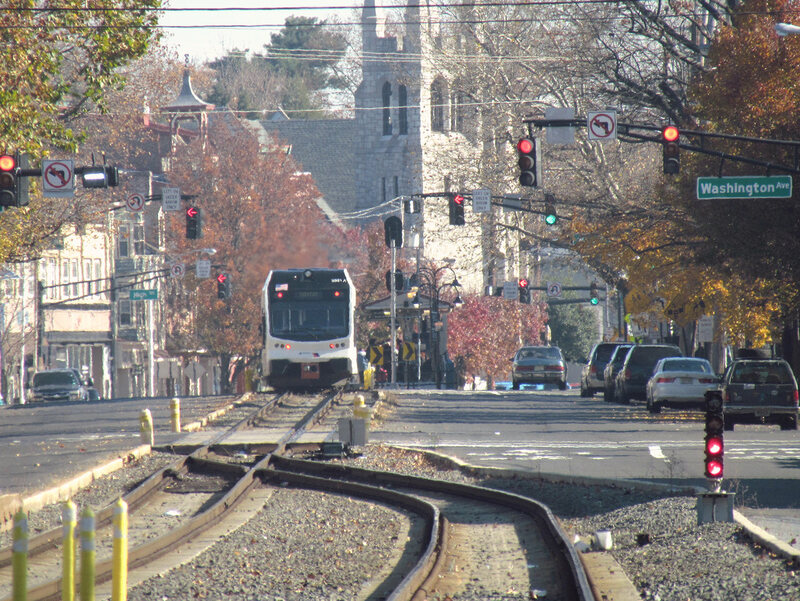 On Track 2 between SHOCKS and COLA is the only segment of real Rule 261 CTC operation that was part of the COLA "CTC" project. I don't know the rationale for employing 261 on only one of the two tracks, but the PRR had a habit of using traffic control systems as sparingly as possible. The 1938 interlocking logic and ,layout was left virtually untouched between when it was built and 2008 when NS finally rolled out the first stage of its Port Road re-signaling project. I don't know many microprocessor based systems that will be able to last 70 years. As in the previous segments I will be using a few photos taken by a friend of the blog in 2004 as well as some additional photos which date from 2007, shortly before it was re-signaled. 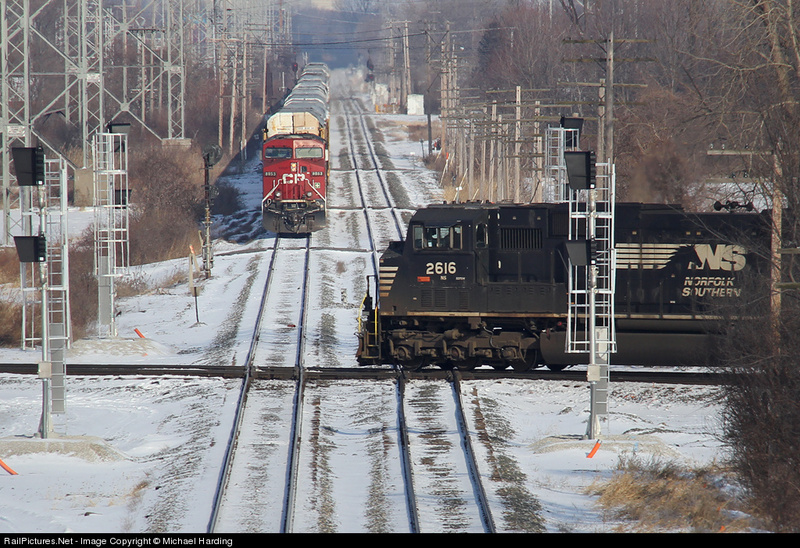 In the above 2004 view we see the westbound main signals at CP-SHOCKS before it was re-signaled. In the original scheme the dwarf was labeled 110R and the mast 112R and these labels were still accurate in 1995 according to the Conrail interlocking charts. In this direction trains run in the Rule 251 ABS fashion with a Restricted speed dwarf for reverse direction movements. Note the 11kv catenary feeders running between the 138kv transmission lines and 6kvsignal power lines. These ran from the nearby Rowenna Substation to the various catenary sections. The high signal still features the traditional PRR layout for the lower head that only provided a backing plate for the | position since in the pre-1956 rulebook trains would approach Restricting and Slow Approach at a speed where a backing was not deemed to be necessary. Ah the PRR, just like that old guy who unscrews the light bulbs he doesn't need. 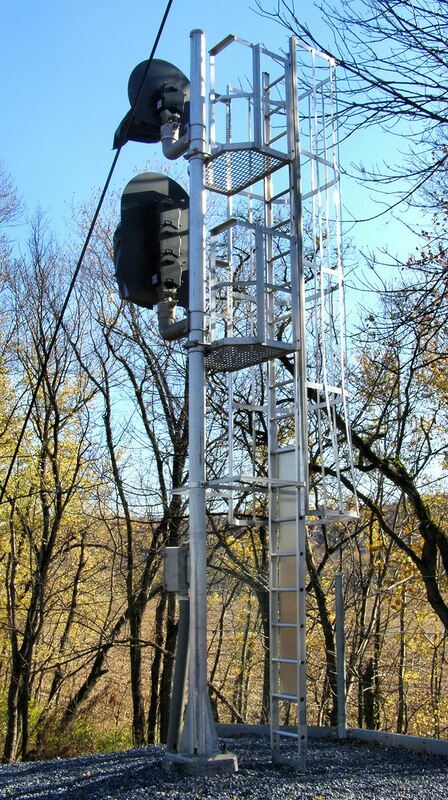 Here is the same 112R mast signal with its Darth Vader replacement in 2007. The full lower head provides for Medium Speed routes onto the Royalton Branch. The rear view shows how age was catching up with the 70-year-old signal, although it was probably nothing that a good coat of paint could fix. The 110R dwarf signal had been replaced at some point since World War 2 with a new Safetran equivalent. 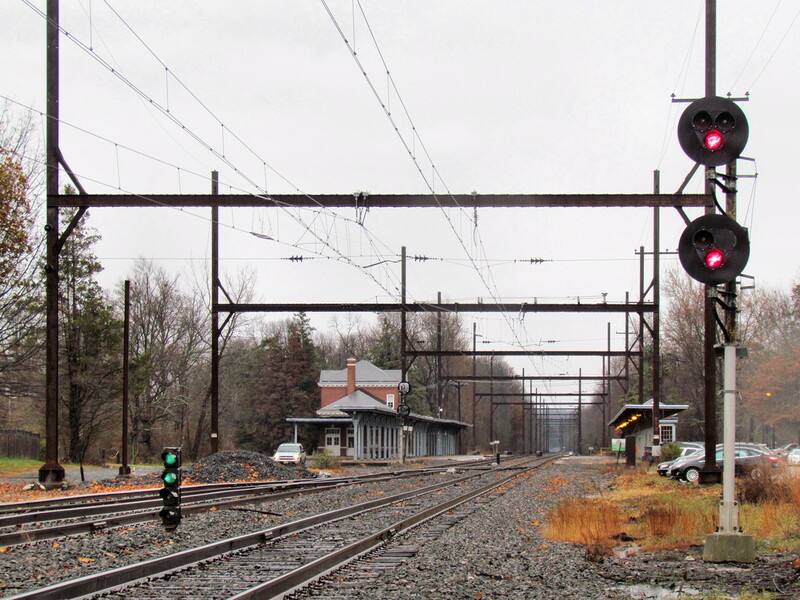 The catenary towers on this part of the line remain standing as one is still used by Amtrak to feed the main line at Royalton. The dwarf was being replaced by a new Darth mast. Although still lacking a full upper head as the re-signaling project was not going to touch the Rule 251 on the upper Enola Branch, it would allow wrong-railing trains to cross over at better than Restricted speed. 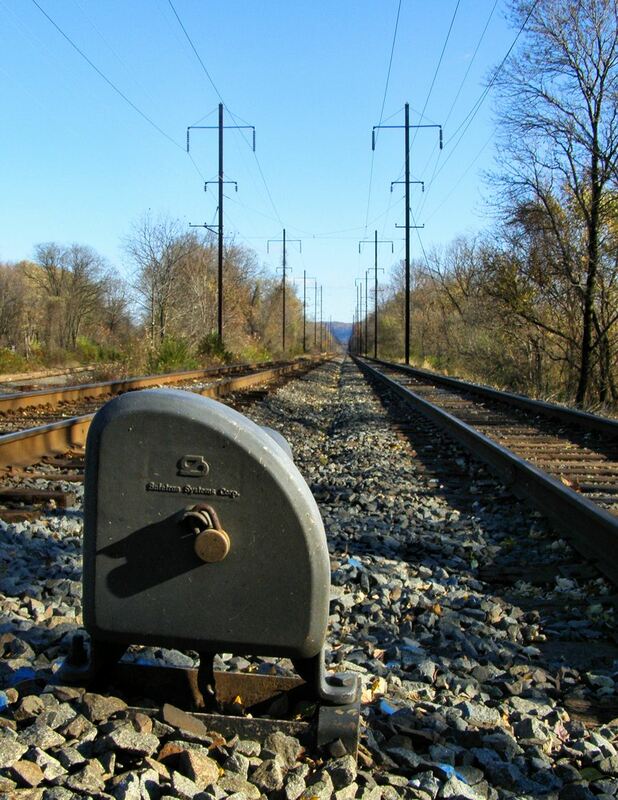 The Marietta Industrial Track featured an original 1938 dwarf signal (112RC) on a concrete mounting, which probably is an issue if any part of the cable run develops a problem. In this pic C&S crews can be seen working at the concrete relay house. The concept of a signal "head" is pretty basic to the understanding of signal aspects. Each head is capable of displaying some chunk of information and in conjunction with other heads on the same signal the entire story is told. In the vast majority of signaling instances the signal heads are easy to identify and are distinct from one another. From the round searchlight targets to the hooded Darth Vaders to the massive position light assemblies, the signal head makes the "X over Y over Z" type North American signal unambiguous in its display. The signal head concept also applies to dwarf signals and "dwarf stacks" are a well known signaling type allowing each dwarf head its own compliment of colors to display. 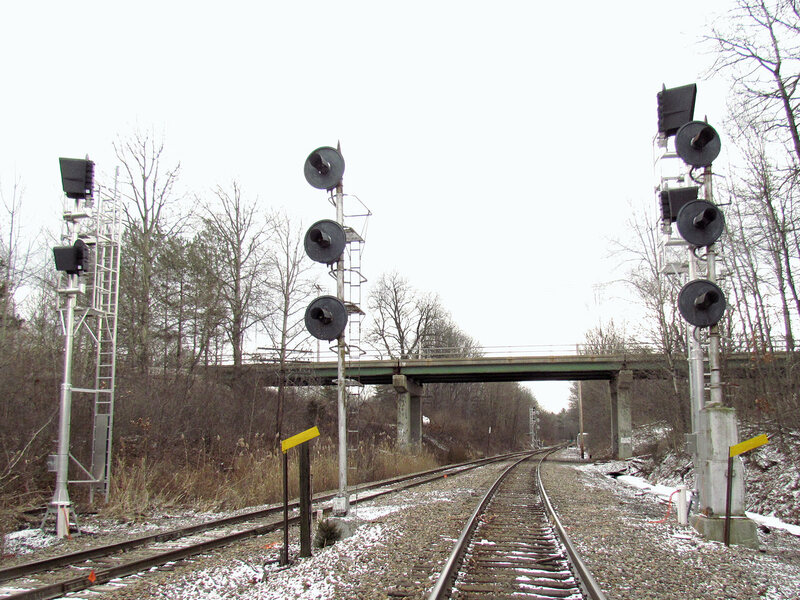 Even where unit lamps are employed stacks of up to 6 units are not uncommon to create two 3 lamp heads such as those seen here at Amtrak's COVE interlocking. The thing is...what if you didn't feel like spending that much money on all those pesky signal heads? A virtual signal head is where what would normally act as a single signal head instead serves as 2 or more using the relative placement of lights without the associated spacial placement. This is generally seen as being a rather severe form of cost cutting and is rare even in North America where signaling hardware is already fairly austere. 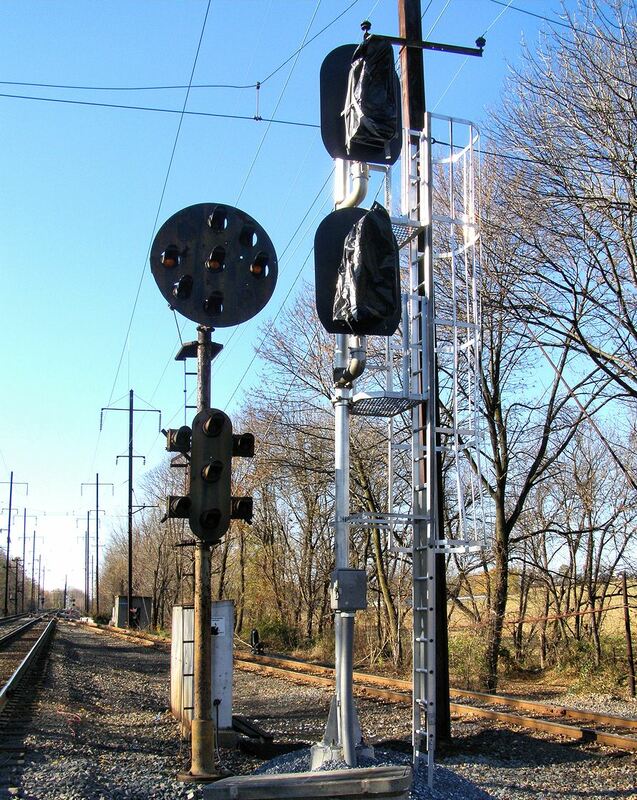 One of the more prominent main line examples is on the former Milwaukee Road main line between Milwaukee and St. Paul, now operated by CP and uses 4-lamp masts to display the full range of weak route signal indications like Y/Y, R/G and R/Y. Or a 5-lamp mast at interlockings where both Y/Y and L aspects are required. 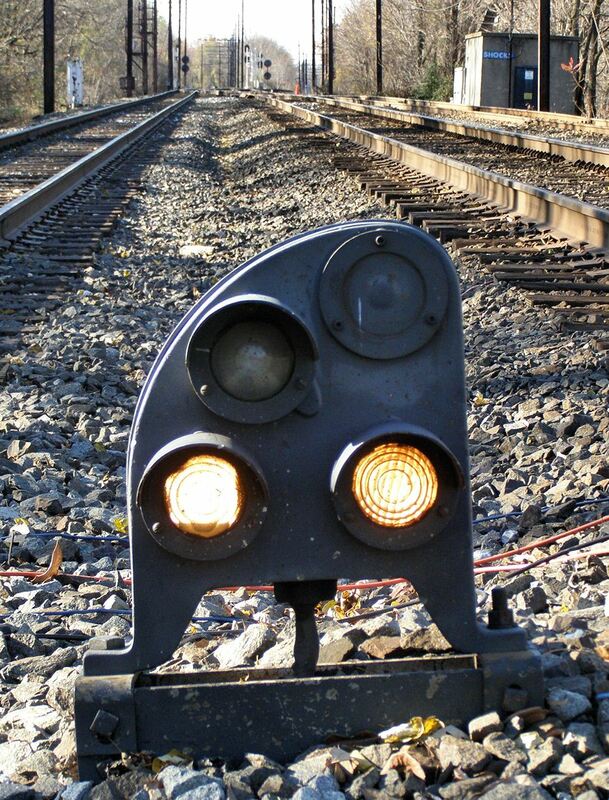 However the cost effective signaling award might just belong to Conrail for its use of virtual headed 2, 3 and 4 lamp dwarf signals. Now this might be more widespread and I'm probably being a bit unfair picking on Conrail, but on the other hand the NORAC signal aspect system was tweaked specifically for just this sort of low cost signaling so I suspect that Conrail was one of the more aggressive users of the practice. How does NORAC cater to the use of Virtual Heads in dwarf signals you ask? G/*R* for Medium Clear and Y/*R* for Medium Approach avoids having aspects like R/G or R/*Y* create conflicts with a virtual head system. 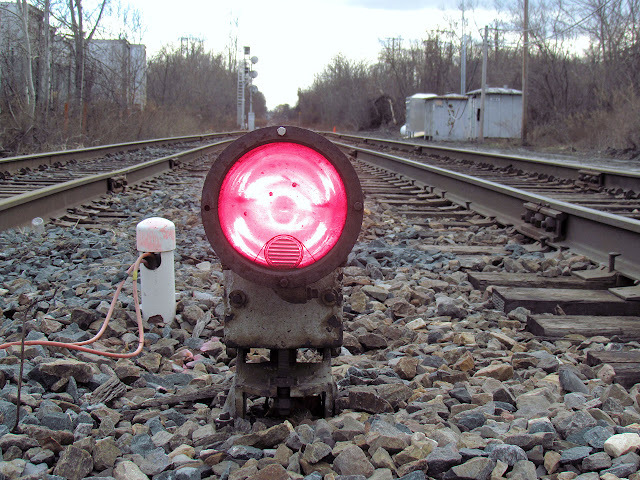 All NORAC dwarf indications can be displayed on a signal with Red on the bottom. Y/*R* Medium Clear at CP-TRENT Yes, its flashing. Why would Conrail care so much when it didn't seem to bother other railroads? First of all there was a lot of Rule 251 double track in the Conrail territory and chronically short on cash the road had to cut itself into profitability. This meant that when making new interlockings for single track or even double track CTC a dwarf was a better deal than a mast. 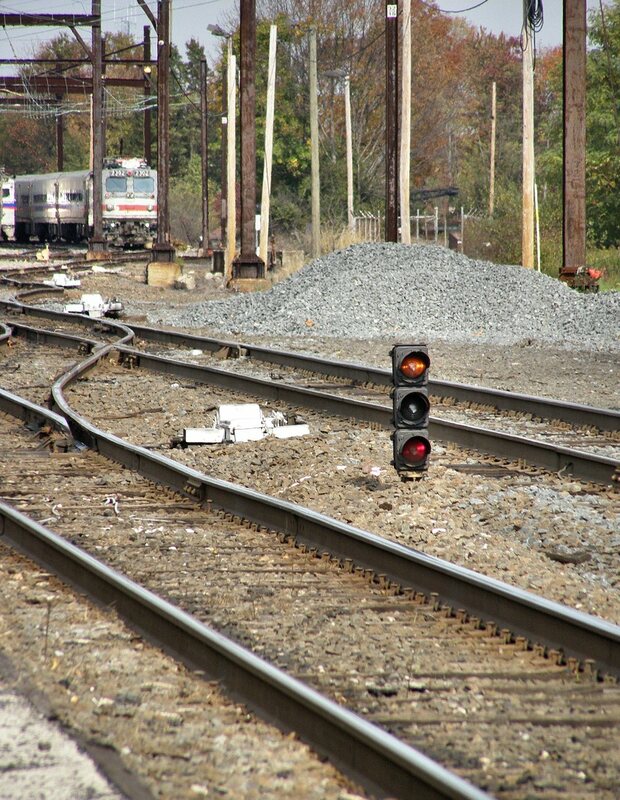 While route signaled roads out west could get by with having a single lamp dwarf display full blown Clear off a signingor reverse signaled route, Conrail's speed signaling system really couldn't. Single searchlight or position light dwarfs limited turnouts to slow speeds so virtual head dwarfs could eliminate the problem for the same price. Conrail went crazy with the concept. A 2-lamp dwarf displaying only Stop, Restricting or Slow Approach could now display Medium Approach. Adding a green lamp gave them Medium Clear, Approach Medium and Approach Limited. Limited Clear was given the coveted *G* dwarf slot so that doesn't really count as a gain, but the C&O was forced to use *G* for Medium Clear on their non-virtual US&S N-3 signals so the extra flexibility is still there. The only two dwarf indications not covered were Y/Y Approach Slow and G/G Clear, with both requiring a 4th lamp (Clear AND Approach Slow would require 5 lamps). 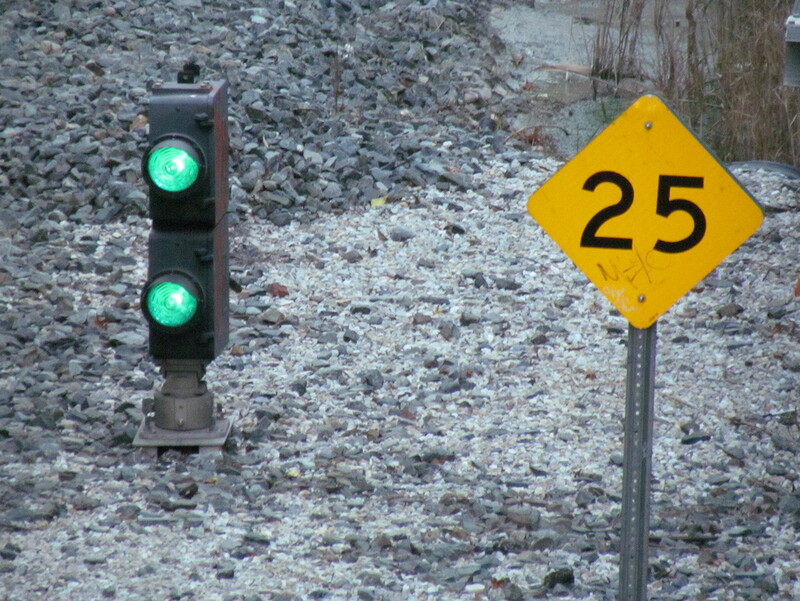 Again, while one might assume the signal engineers would want to put a gap between the greens such as G-Y-G-R that would be an incorrect assumption, especially where a 3-lamp is getting an upgrade to 4-lamp, such as a Rule 251 route going 261. For comparison New Jersey Transit, which prefers to use non-virtual head dwarfs, must use 6-lamp dwarfs to get the same aspects that Conrail could squeeze from 4. Here is a 6-lamp dwarf stack at the new DIVIDE interlocking displaying Medium Clear. On the NJT RiverLINE NJT was responsible for the initial signaling design which resulted things like this 7-lamp monster at the Trenton Station. 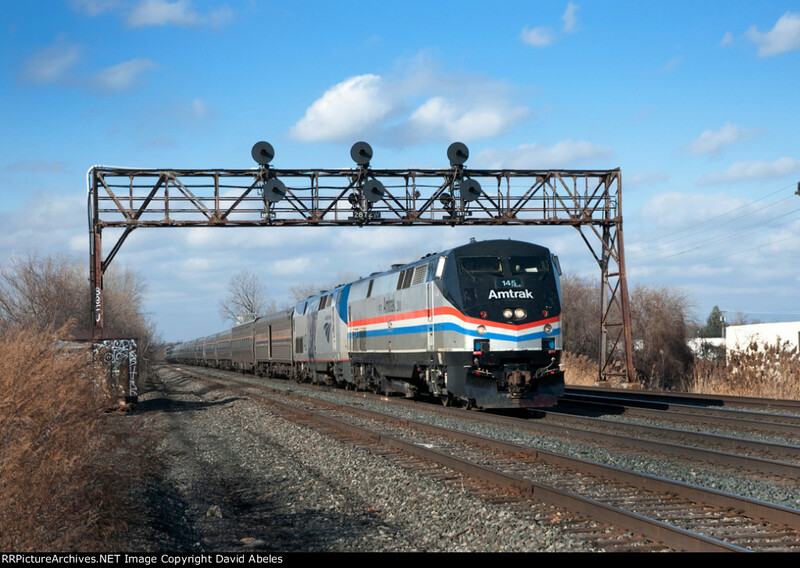 But from the new signaling designs it appears that Conrail SAA has had a hand in subsequent modifications like the conversion of a mast signal to a dwarf south of Burlington which uses 4-lamp virtual headed dwarf. Which even maintains a virtual R/R as seen below. 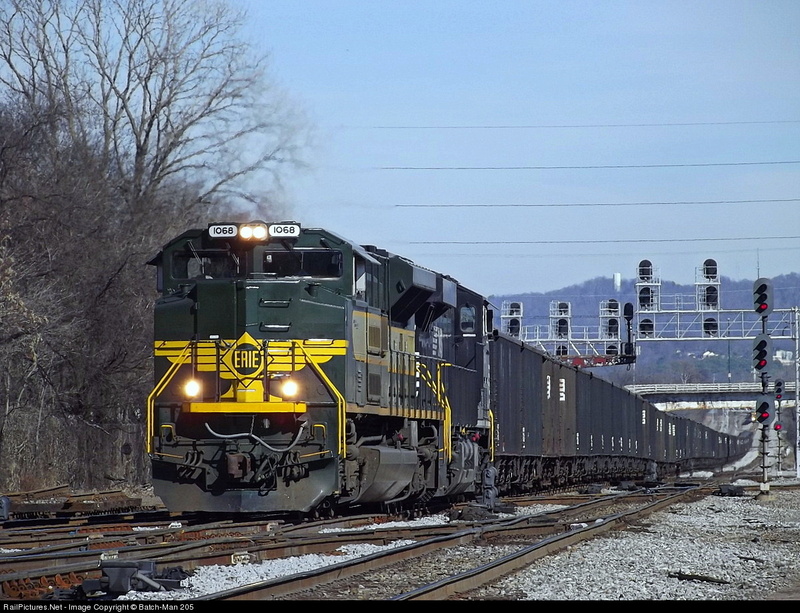 There are other instances on the RiverLINE of huge 5 and 6 lamp signals being converted into more compact varieties such as a Y-R-Y-R unit designed to give Approach Slow. 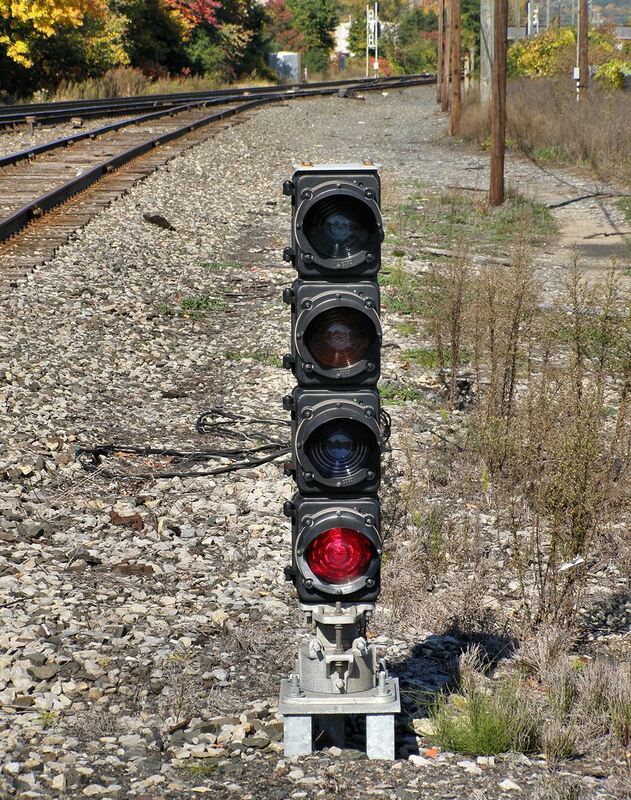 Let's take a quick look at some other popular speed signaled railroad. In this rather unique Canadian example we see a US&S N-2 dwarf attached to an H-2 searchlight to create a 3-lamp dwarf signal capable of displaying Restricting and all the other slow speed indications. 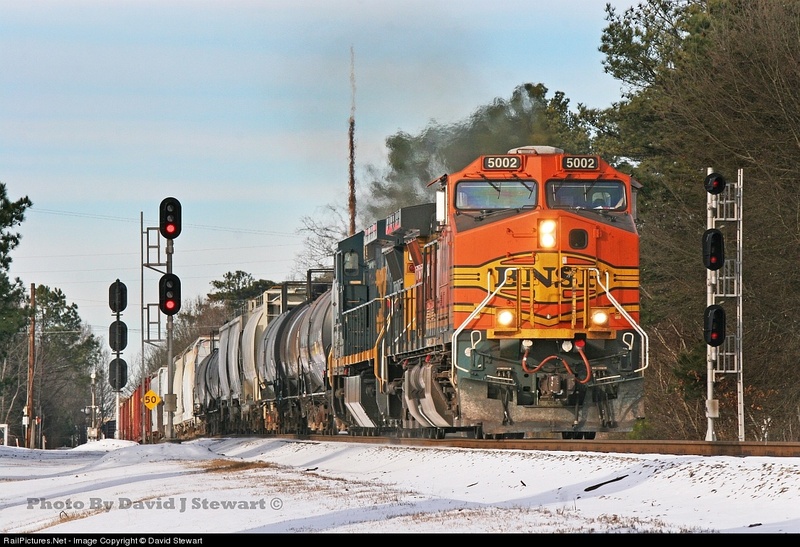 Because of its Lunar White fetish, the use of 4-lamp dwarves on CSX is common, but unfortunately its use of R/Y and R/G for the "Medium" indications means it is harder to employ virtual heads. 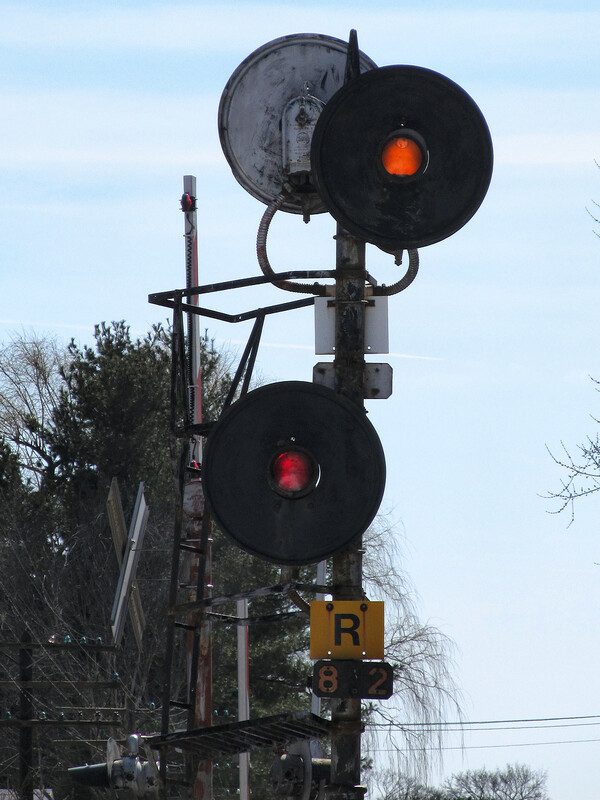 Of course it does make it easier to tell if turnouts are signaled for slow or medium speed such as this example on the re-signaled former Conrail Selkirk branch at CP-SK. Had CSX stuck with NORAC an upgrade would have not needed any hardware changes. Typical slow speed CSX 4-banger dwarf. Slow Approach without all the flashing. More often than not CSX is going to spend the money on a twin stack of Unilens searchlight signals like these displaying Clear the old fashioned way at Huntington Ave in Baltimore. 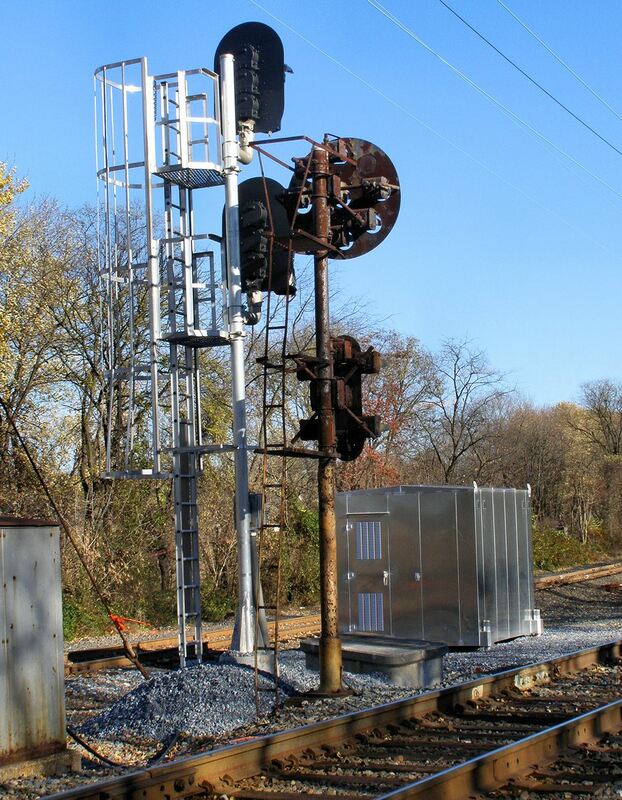 As for the former Conrail parts of NS, I am sure that the virtual head system is still in use, but I also know that NS seems to be much more committed to using signal masts, even in instances where a simple 3 indication dwarf would do such as here at CP-WORKS. What's the takeaway? 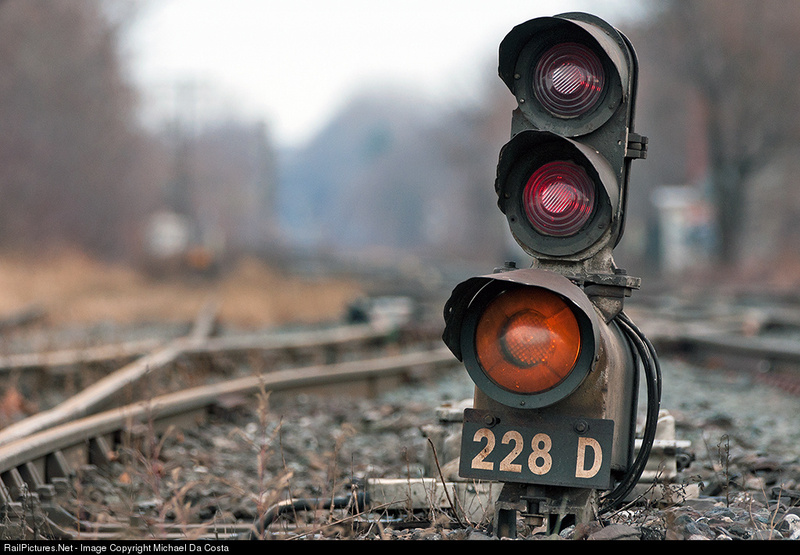 What is implied by a signal aspect chart can always be ignored or tweaked by a clever railroad just like a clever railroad can play fast and lose with signal progression or play cab signal tricks...but more on those later. While 9 or 10 signal rules might sound like a lot compared to the 21 or seen in under NORAC or CSX, the D&H finds itself in good company with many other railroads not operating multi track main lines in and around busy urban terminals, especially those making use of route signaling. 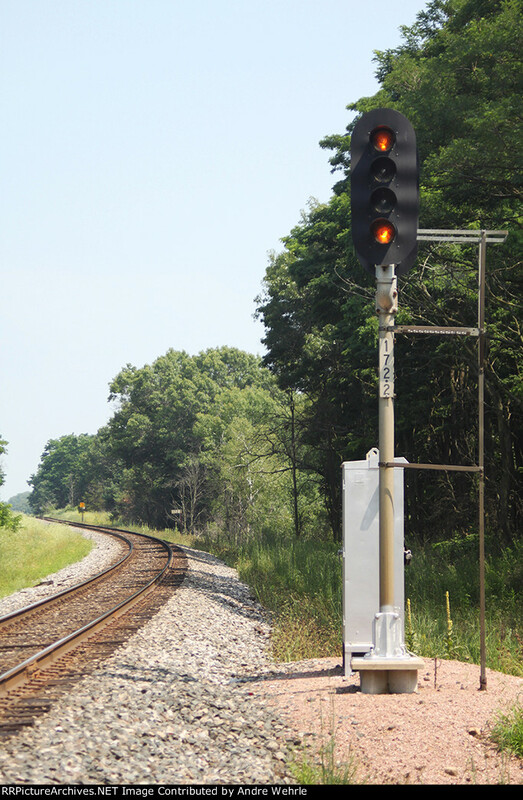 The D&H is a very conventional speed signaling system designed for single main track operation with passing sidings. 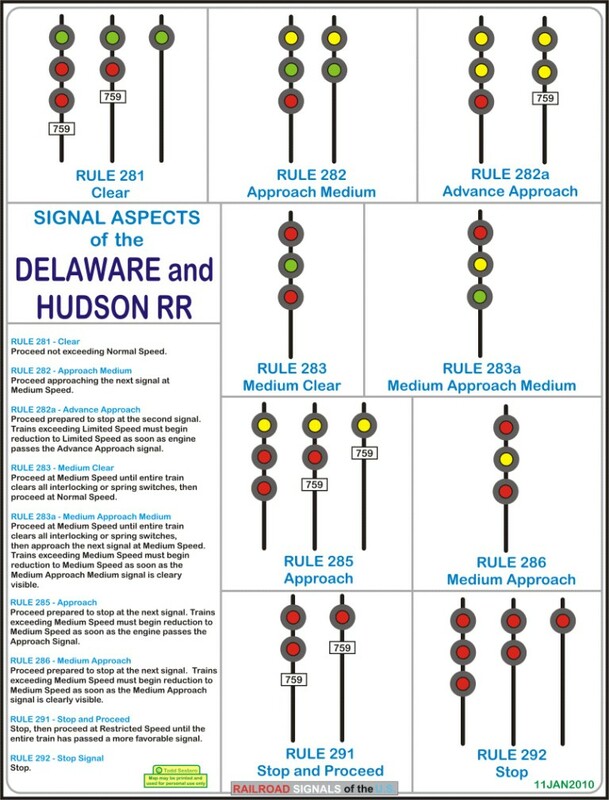 If you remember back to my signaling dialects post you'll see that the D&H uses Y/Y for advance approach, R/Y/G for Medium Approach Medium, R/Y/R for Medium Approach and R/Y or R/R/Y for Restricting. 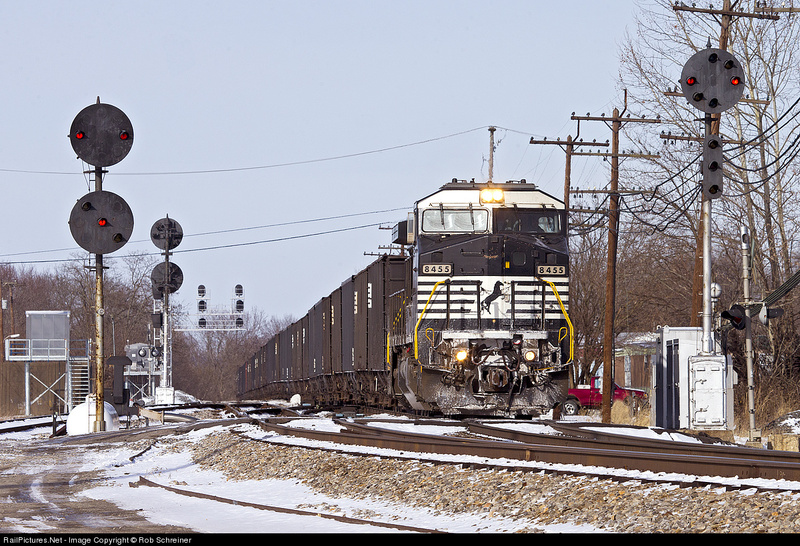 The R/Y/G Medium Approach Medium was made possible because the D&H made a point to use high signals at siding exits and R/Y/R Medium Approach was enabled by using only three headed signals at interlockings. 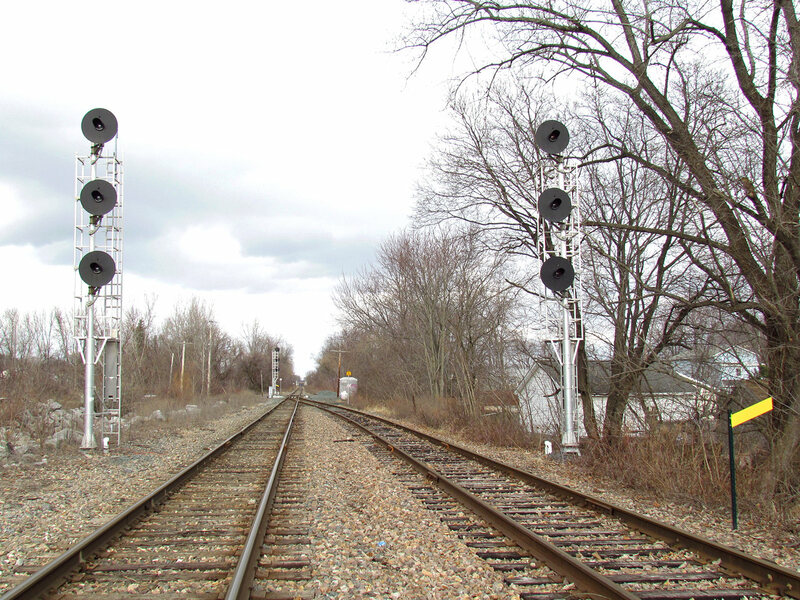 Here is an example of the three head policy that was still in effect up through about 2011 with brand new Unilens tri-heads installed on the former D&H Colonie Branch at CPO-5. 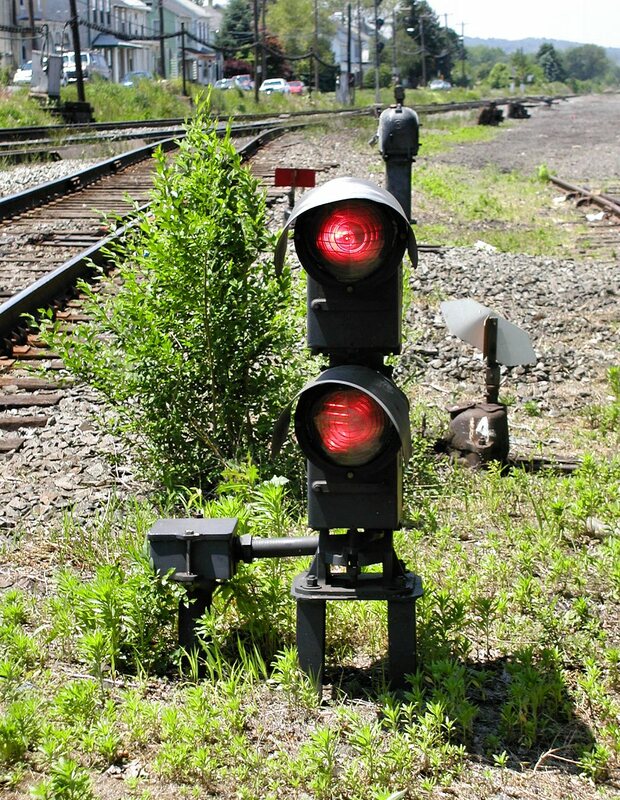 Unfortunately since CP went all Darth Crazy, two head signals are now being allowed to slip through as seen here at CPF-478. Hmmm, looks like they are dumping right handed placement as well. 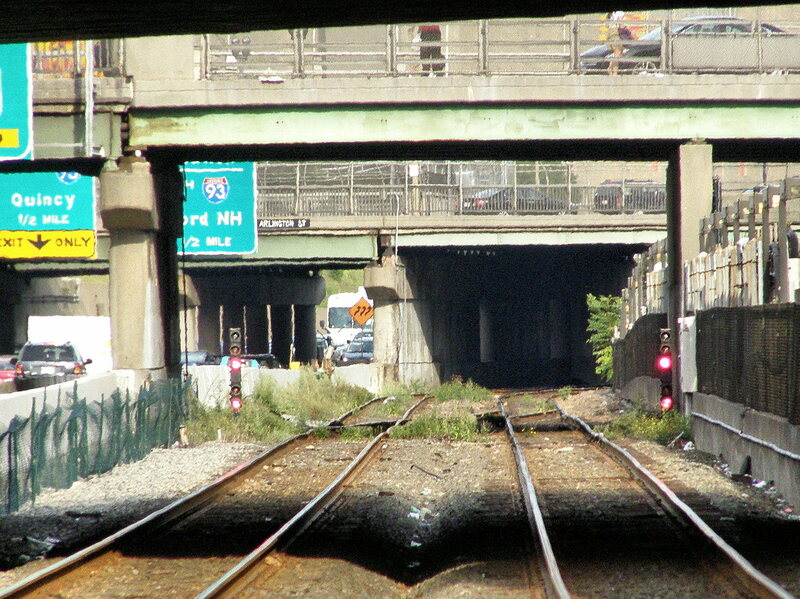 Contrast with the Boston and Maine's CPF-464 right across the Hudson River which has no problem making use of two headed signals and R/*Y* Medium Approach. Another interesting practice that comes across on the 1948 signal chart is the use of offset heads for automatic signals. A common practice back in the day, but one that is still followed in Canada to mark automatics instead of number plates. It is not surprising that under CP ownership this practice was not challenged. 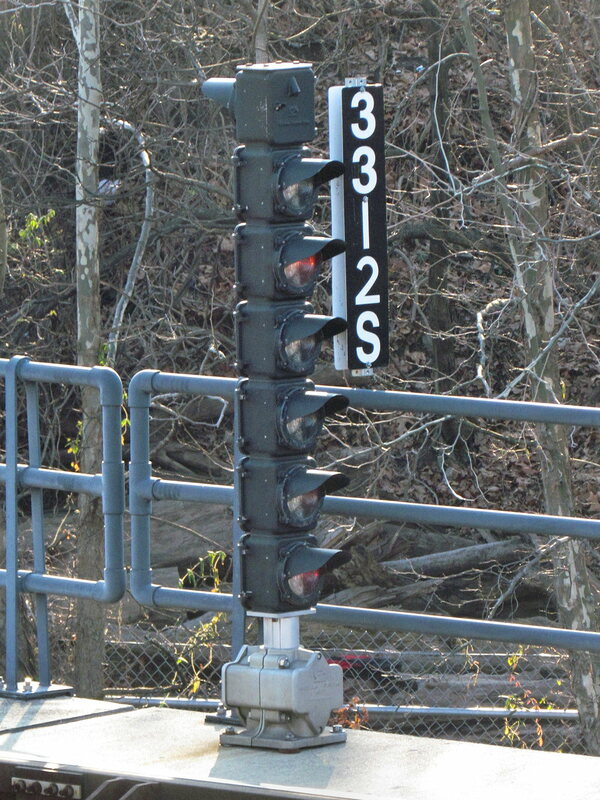 Although not a new CP install here is the MP 8.2 automatic on the Colonie Branch with the offset heads. Staying with the 1948 chart we find a few interesting tidbits when it comes to dwarves. 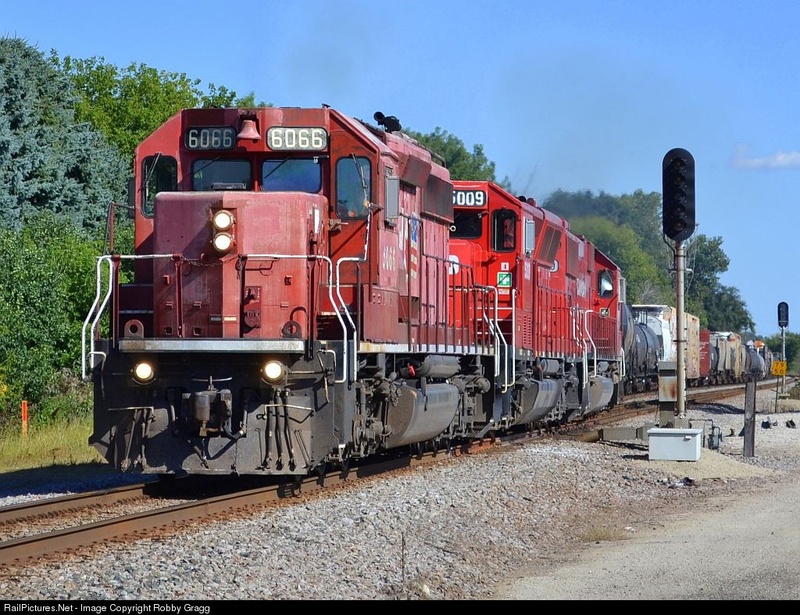 Without slow speed indications the D&H could use G/R for clear and Y/R for Approach. R/*Y* was used for Medium Approach to make room for R/Y Restricting. The most interesting dwarf was Y/G for Medium Approach Medium, which I guess came up more than Approach Medium. Single head dwarfs were limited to Y and R/Y Restricting and R Stop. So kudos to the D&H for not installing Slow Speed turnouts I guess. Aside from its dwarfs the only non-NORACy indication the D&H adopted was the Y/Y Advance Approach. Of course with no slow speed signals it makes perfect sense. There was also a R/Y/Y Medium Advance Approach, which was left off the Railroadsignals.us chart. The thing is that when the Guildford Rail System (ex-B&M) purchased the D&H in the 1980's it did more than re-mile the main line from Binghamton to Maine. In the 2007 CP Northeast US Timetable (towards the end) we can see that the signaling has gotten a lot more...conventional. There is suddenly a R/R/G and dwarf G Slow Clear along with dwarf *Y* Slow App. To compliment those Y/Y is now Approach Slow and *Y* picks up Advance Approach. All the other old dwarfs are just plain gone except for Y/G, which is now Approach Medium. So that's the story of the D&H signaling system. It started out pretty conventional and then got even more-so after several new owners put their hand in the pie. Yup, its time for another news post and this time I will be showing some examples of old things that are being discarded and old things that are being kept around. In what is probably a first CSX is getting a pass from the news as for once i don't have any new examples of their bull headed signal desecration. Anyway we begin with the former N&W NS Columbus District where the southern end of a Rule 251 segment at Portsmouth, Ohio is being sterilized with CTC and Darth Vaders. 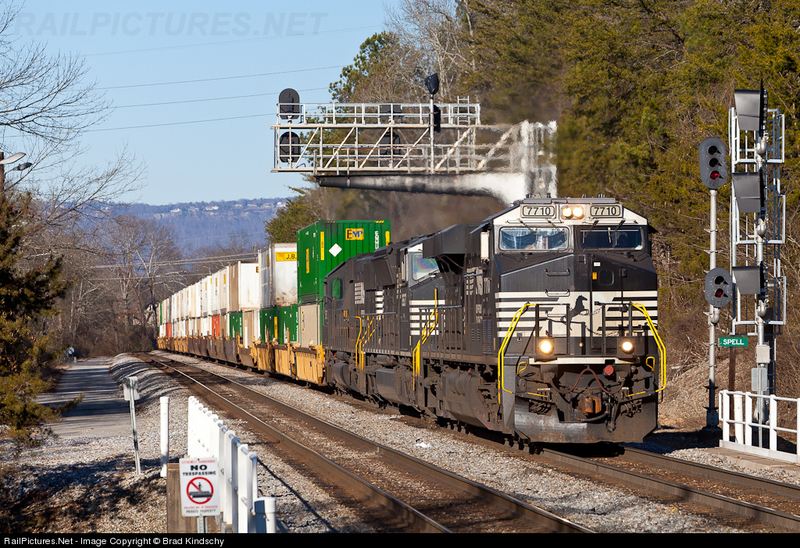 Here we see NS wasting an absolute tank of a cantilever gantry being squandered by NS at SPELL interlocking in the Chattanooga area. Come on, that wouldn't rust away in a century of Sundays. More updates from the slow motion re-signaling project in the Birmingham 17th St Junction area. Looks like this one isn't just about the signals, but also involves new switches and track layouts. 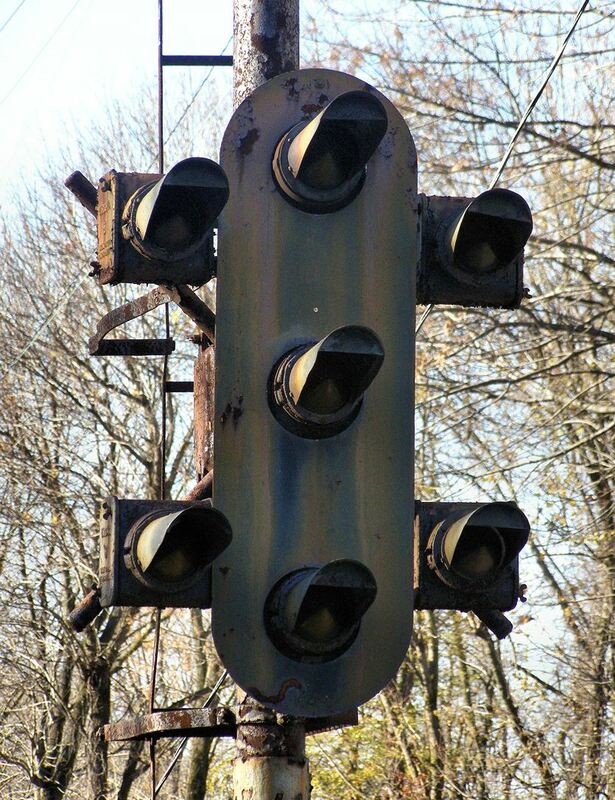 Now onto the news of old signals being left in place. 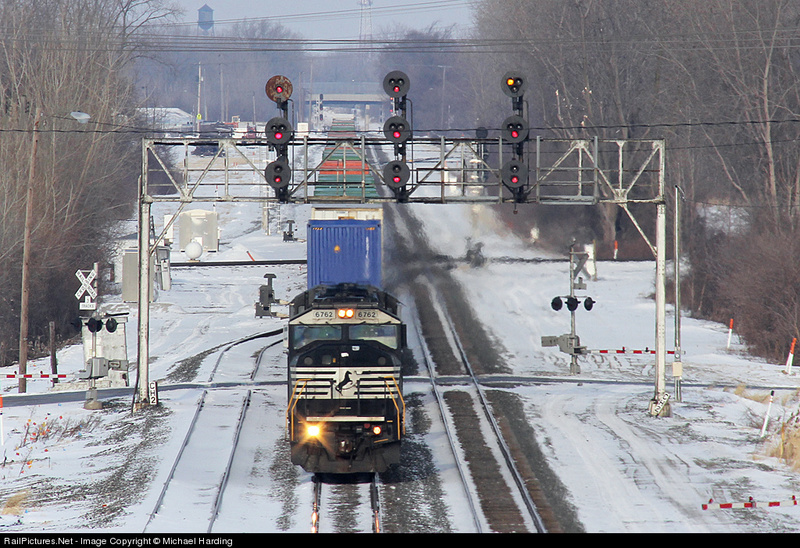 A lot of people have pointed out that the famous "Vickers" Interlocking east of Toledo, OH is on track to be re-signaled. Now that part is true with the signals on the crossing CSX line and the eastbound NS signals being replaced due to a siding capacity increasing mod, but the most important and most famous part of Vickers, the three track westbound NYC signal bridge, appears to be safe for now. Here is the view along the CSX line. And the classic NYC signal bridge. The eastbound signals and replacements are visible in the background. The replacements are going up because of new intermediate signals being installed on what used to be a one block (or no block) siding. 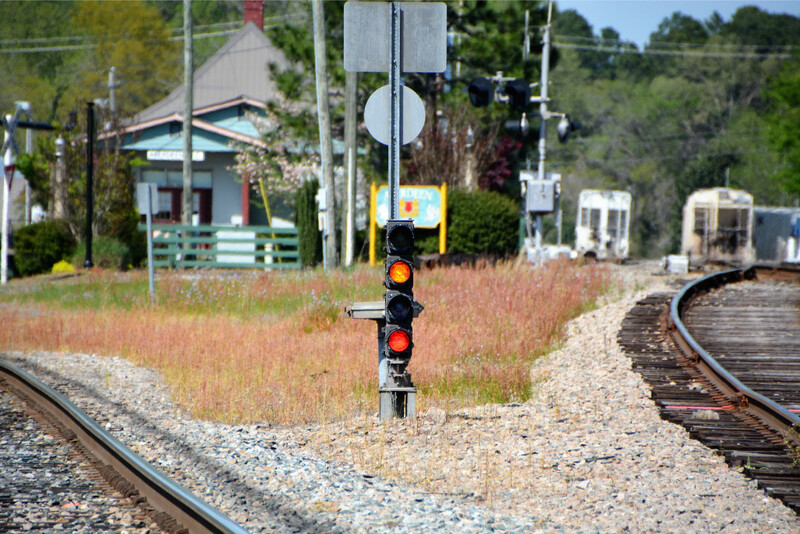 Here is an odd signaling arrangement at a CSX interlocking in Georgia. Far signals are original SCL elephant ears. Close signals are a standard Darth Vadar and a non-Darth LED traffic light. Could this be a portent of the future? While CSX is ripping and tearing all sorts of stuff on the former Chicago Line here is a 3x3 NYC signal bridge in Syracuse with small target searchlights in one direction and large target Unilens searchlights in the other. Not sure what caused that, but I'll take it.